What does the jazz-loving swamp country of New Orleans have in common with the wild high desert of Tucson? The answer: more than you may think. Like countless communities across the globe, both of these ionic U.S. cities have water concerns—New Orleans faces the challenge of taming powerful floodwaters that frequent the region while Tucson struggles to secure enough water to quench the thirst of its growing population. Despite having contrasting water issues—too much versus too little—these cities are implementing the same water management strategy to create solutions. One Water is a concept and approach that has been part of the conversation within the water industry for a number of years, however, it remains new to many industry, political, and consumer influencers. Most commonly, a community’s water management system is fragmented by the various modes through which the water is delivered and used. It’s typical for several different agencies to have jurisdiction over specific types of water and communication between those agencies is minimal (if it exists at all). 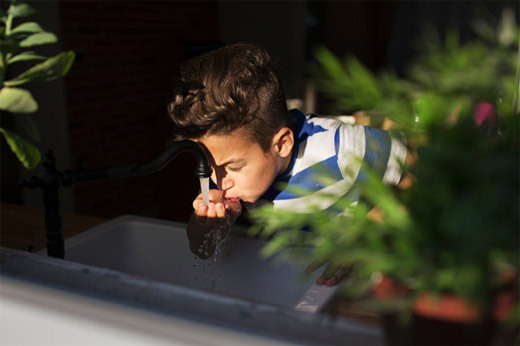 Whether the water flows through a school’s drinking fountain, a farm’s irrigation system, a community stream, or a sewage pipe usually determines who has authority over the management of that water source. Like most things in life, however, all that water is intimately connected and should be considered as one, single resource. One Water is an attempt to modernize and bring more efficient and effective order to the way communities manage their water sources by viewing the resource holistically and managing it to provide multiple benefits. Despite its relatively young age, the Pisces Foundation has taken bold steps toward creating a world where people and nature thrive together. To fulfill our vision of a future where all communities have access to safe and abundant water, the Water Program collaborates with funders, community leaders, and non-traditional actors to transform the way we value and use water. One Water is a critical element to this effort because we believe approaching water in a more comprehensive and integrated way is a powerful remedy for the water challenges encountered by many urban areas across the country. Through the Pisces Foundation, several groups have received funding to implement One Water in their communities, and the progress has been significant. The cities of New Orleans and Tucson are using a One Water strategy to address the extreme flooding that frequents the cities after rainstorms. The cities of New Orleans and Tucson are using a One Water strategy to address the extreme flooding that frequents the cities after rainstorms. New Orleans faces some of the most severe water management challenges in the nation, as even small rainstorms can cause extreme flooding and degrade water quality. Managing the enormous amount of water requires massive pumping and power facilities, which are expensive to run and account for more than half of the city’s carbon emissions. 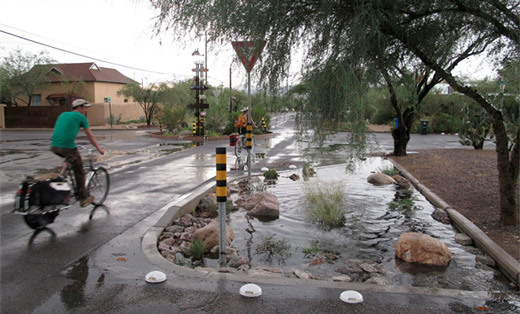 One of Pisces Foundation’s grantees, the Trust for Public Land, has utilized One Water to reduce the volume and velocity of flooding by promoting infiltration through water smart parks, greenways, and complete streets. This resilient planning approach to existing wastewater, stormwater, and floodwater systems allows the city to bring economic vitality and enhanced public health to the city in addition to reducing water vulnerability. In the Sonoran Desert, over 1,400 miles away, Pisces Foundation grantee American Rivers is helping the city of Tucson fulfill its vision of living within its current water budget while having enough water left over to refill its dried-up tributaries and restore critical ecosystems. 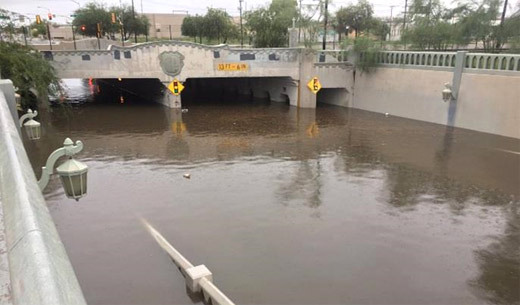 Although Tucson’s annual rainfall averages to only 12 inches, it is delivered by powerful deluges that cause intense flooding. American Rivers is assisting local partners to develop a tool that would help city planners precisely determine where green infrastructure would most efficiently retain and infiltrate stormflows. The ultimate goal is to manage the water close to its source to facilitate groundwater recharge and reduce the city’s dependence on water from the Colorado River. American Rivers and its local partner, the Watershed Management Group, also work with private landowners to design their landscapes to help restore Tucson’s heritage of flowing creeks and rivers through a voluntary program called River Run. Green infrastructure, one element to a One Water approach, is used here to capture stormwater runoff and direct it into underground reservoirs for future use. Collaboration is the key to implementing One Water. Bringing together local utilities, state governments, non-profit organizations, industry experts, neighborhood associations, and other stakeholders to examine the community’s water usage and treatment through the lens of the hydrologic cycle is essential. While a diverse group of entities will often voice conflicting needs and perspectives that can challenge a One Water approach. At the end of the day, however, everyone wants clean and abundant water, and we can accomplish much more together than we can alone. The Pisces Foundation believes that One Water is a powerful 21st-century solution worthy of water’s essential role in our lives. If we work together to modernize the way we value, use, and sustain water, we’ll have safe and plentiful water flowing from every tap today and tomorrow. Nancy Stoner is director of the Water Program and a Senior Fellow at the Pisces Foundation, leading efforts to secure clean and abundant water for people and the environment. Most recently, she served as Acting Assistant Administrator for U.S. EPA’s Office of Water. Prior to the EPA, Nancy was the co-director of the National Resources Defense Council Water Program. She also worked as Director of the Office of Planning and Policy Analysis in the Office of Enforcement and Compliance Assurance at the EPA and as an attorney for the U.S. Department of Justice in Washington, D.C. Nancy is a graduate of Yale Law School and the University of Virginia.